Yesterday was a Wi-fi less day at the hotel and my blog post is thus a little delayed. Never the less, I had a great last day at the Colloquium. You must be wondering why I have not written much about educational systematic reviews. The reason fo this is that the education group focuses mostly on primary and secondary education. I have actually registered the first title in the Campbell library on adult education. I realised that at the Education group’s meeting. It was really good to meet the people I have been talking to via email. 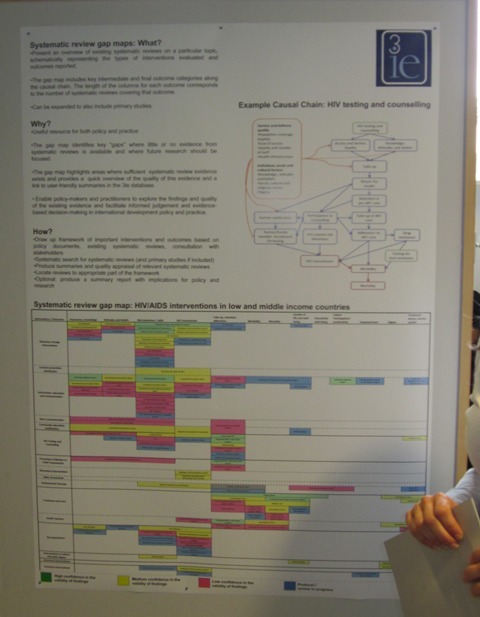 But yesterday, one of the poster presentations addressed online learning of systematic reviews. The focus was on tutor feedback. The feedback was given either on the discussion board or via personal email. I think podcasts can also work very well in an online learning environment – it would be interesting to see whether students prefer verbal feedback via a podcast or written feedback. I realised that there is so much to explore when it comes to online learning. I think ultimately the goal should be to make the learning experience as authentic as possible. 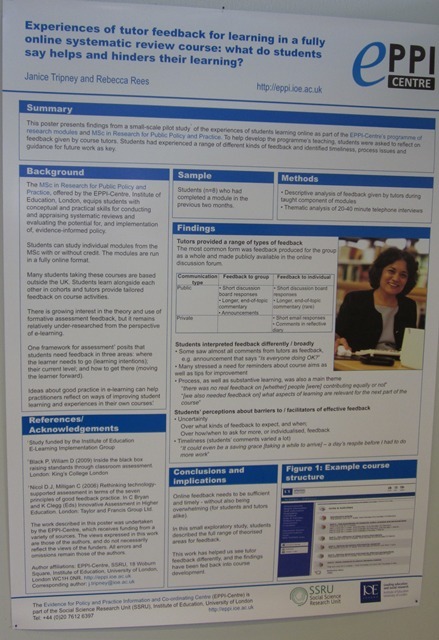 The authors of this poster are affiliated with the Evidence for Policy and Practice Information and Co-ordinating (EPPI) centre in London (http://eppi.ioe.ac.uk). They provide an online library of systematic reviews in the fields of health promotion, public health, social care and education. They are also involved in projects which aim to develop capacity in evidence informed policy and practice in education in Europe; have online courses in conducting and using systematic reviews as well as a maters in Research for Public Policy and Practice. I still have to explore their website in detail, but it seems like a good resource and perhaps we can even learn something from their online courses. Interestingly, I met two people working at the University of Johannesburg, in collaboration with the EPPI centre. They are in the process of establishing the Collaboration for Environmental Evidence and aim to conduct systematic reviews for environmental management (www.environmentalevidence.org). Overall, the colloquium was a great learning and networking opportunity and a wonderful experience! I cannot believe that I am leaving this beautiful city with its friendly people today – time really does fly when you are having fun. I leave you with this photo of Nyhavn – the “new harbour”, which is a very popular spot, with a lot of small cafes and a brilliant holiday atmosphere. 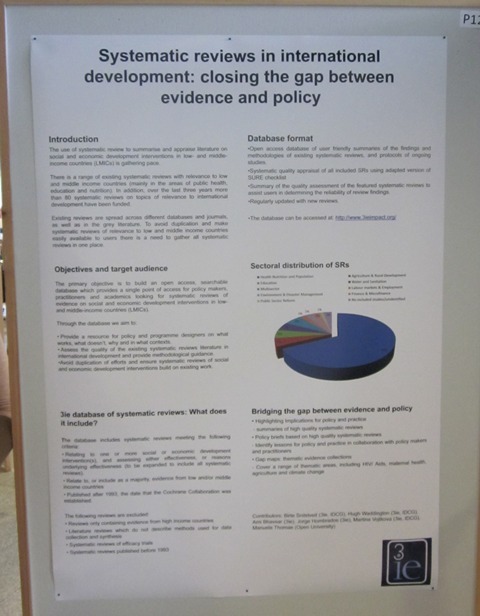 But, my pick of the day goes to a poster titled ” Systematic reviews in international development: closing the gap between evidence and policy”. 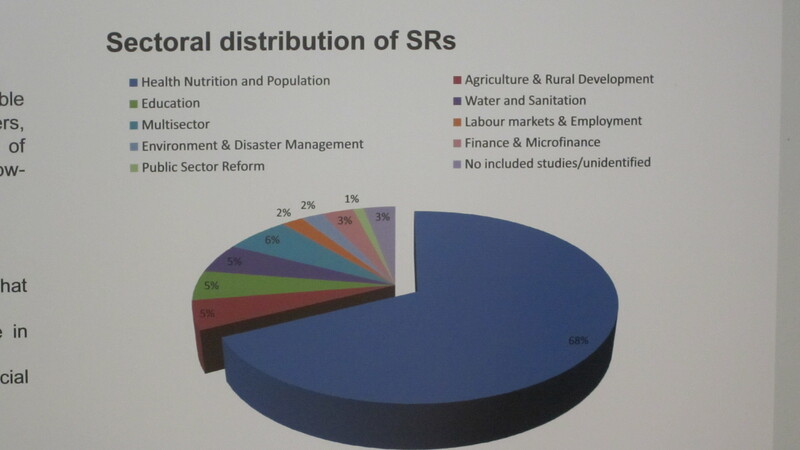 This research was conducted through 3ie – International Initiative for Impact Evaluation. The pie chart shows the proportion of reviews done in particular areas. The large blue piece refers to systematic review related to health care. Although I knew that most systematic reviews were done in this area, I was surprised that they actually comprise more than 60% of all reviews. As part of the study, they also did a “gap analysis”. They looked at specific topics (HIV/AIDS and Maternal health – to date) and mapped out the systematic reviews that exist in these areas, as well as the quality of evidence provided by them. One thus has a overview of what evidence is available and what is still needed. 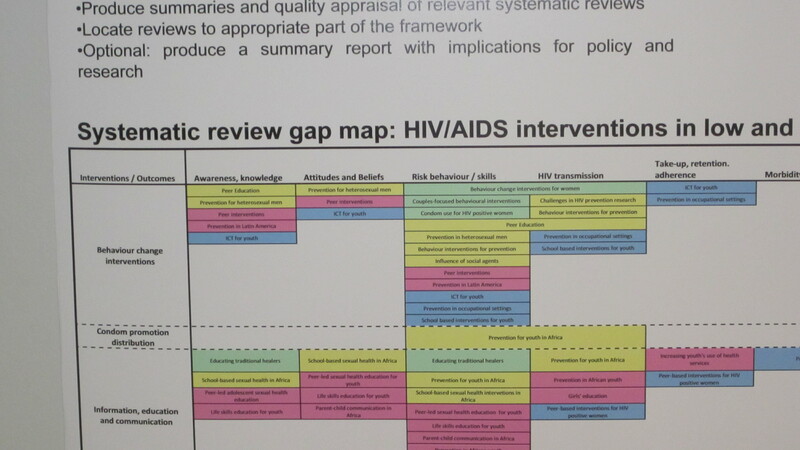 This is an example of the HIV/AIDS gap map, which can be seen in the table. The reviews are colour coded according to their quality. This table, as well as the one for Maternal and child health, is also available online (www.3ieimpact.org). The reviews in the table link to the full text and the summary thereof. I think this is a very useful tool when deciding where research is needed and I had to think back to our priority setting exercise with the EHCRC. Although the author mentioned that this is still work in progress and will need to be updated regularily, I think it is worthiwhile to visit the website to find out more! Today was the very interesting first day of the Campbell Colloquium. It was intriguing to hear people in areas other than health care, talking about systematic reviews. While the plenary sessions focused on knowledge translation, the workshops addressed basic and advanced concepts in conducting systematic reviews. Although the workshops focused on social science reviews, I discovered that the methodology is not really different from Cochrane reviews. It is mostly the terminology that varies. As I am sitting here, wondering what the highlight of the day was, I realise, that there was never a dull moment. Every session was great! But, I think the most thought-provoking presentation was the opening plenary by Prof Sandra Nutley: The need for a better map and different shoes: connecting evidence, policy and practice in an era of austerity, complexity and decentralised decision making. In a nutshell: This presentation focused on knowledge translation (KT) activities and how we should put more emphasise on the social contexts in which we want our research to provide the answers we need to improve the situation. She explained the three generations of evidence (Best 2008): In the 1980’s, the focus was on Knowledge transfer. Knowledge was seen as a product, and its degree of use a function of effective packaging. In the 1990’s, the focus shifted to Knowledge exchange, where knowledge was regarded as the result of social and political processes and its degree of use a function of effective relationships and interaction. Since 2005, the focus is on Knowledge integration, where knowledge is embedded in systems and cultures and the degree of its use a function of effective integration with organisations and systems. It is important to know that these notions exist in parallel, although most models on KT still reflect 1st and 2nd generation thinking. KT activities should be seen on a spectrum from increasing the use of explicit evidence on the one side; to creating environments that encourage engagement on the other side. “Yes, it’s quite a noise. But are we having any impact?” This is the question we should be asking ourselves. Regardless whether we are referring to health care, education, economics or criminology. My name is Anke Rohwer. 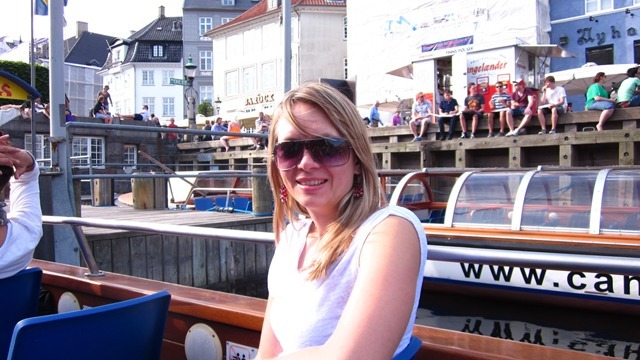 I am a researcher at the Centre for Evidence-based Health Care at Stellenbosch University, South Africa (www.sun.ac.za/cebhc) and have a background in Midwifery and Clinical Epidemiology. One of the main activities of our centre is writing systematic reviews. I have recently registered a new title (E-learning versus face-to-face learning on evidence-based health care (EBHC) for increased EBHC knowledge and skills in postgraduate health care professionals) for a systematic review with the Campbell Collaboration. The Campbell Collaboration is an international research network that prepares and disseminates high quality systematic reviews of social science evidence in three interlinked fields: education, crime and justice, and social welfare (www.campbellcollaboration.org). Similar to The Cochrane Collaboration, the Campbell Collaboration hosts a colloquium every year. 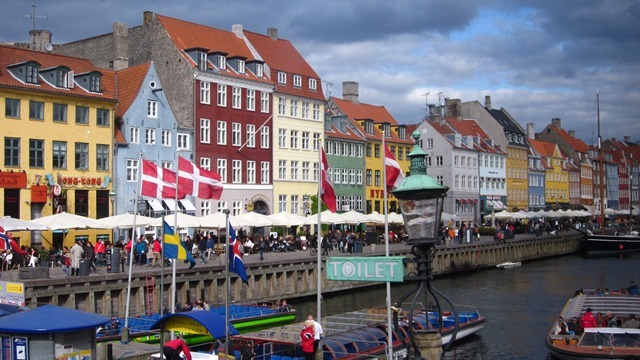 This year, it will be held in Copenhagen, Denmark, from the 29-31st May 2012. Not only will I be attending this year’s colloquium to learn more about systematic reviews in the educational field, but I will also be blogging about my experience! In this way, I can share all the knowledge that I will be gaining on a daily basis!